As part of the new extension to the Jersey Museum in 1992 Roy Reed produced a wide screen slide programme which introduces the visitor to the history of the island by featuring some of the objects from the museum's collection. The resulting "Jersey, a Place in History" is a compact tour of the island's physical and cultural landscape that ranges from Stone Age settlements to computerised banking. Reed produced and photographed the programme as well as designing and specifying a purpose-built, multi-image theatre with multi-language, stereophonic sound. 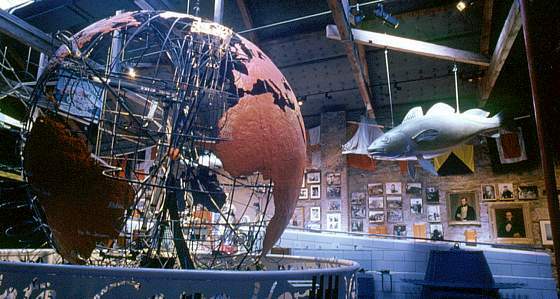 The Jersey Museum was the winner of the British Guild of Tourist Writers "Silver Otter" Award for Best New Visitor Attraction in the British Isles, 1992 and the National Heritage IBM Museum of the Year, 1993. 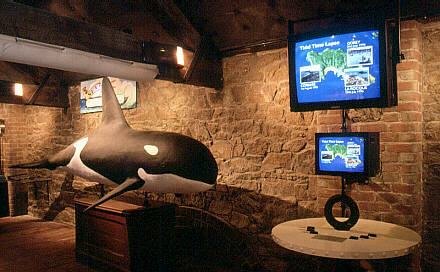 For the Maritime Museum Reed designed and produced a number of the audio visual exhibits. Clicking on the large television in the picture above will run a video of the La Rocque time lapse sequence. Clicking on the smaller one will run the Gorey Harbour video. Clicking anywhere else in the image will run the Corbiere video. These movies are about 14MB each. These included time-lapse filming of the island's extraordinary tides, creating a computer graphic model of the tides and currents that flow around the Channel Islands and producing a number of soundtracks which accompany many of the exhibits, including the large animated globe. The Voyages Globe is a three metre high, animated sculpture which depicts four voyages that were made by sailors from Jersey during the nineteenth century. Reed produced the soundtracks that accompany the globe. Based on original log books, letters and journals, these stories tell of fires and storms, cruel captains and mutinies, the sighting of comets and the ravages of scurvy. The Jersey Maritime Museum was the winner of the National Heritage NPI Museum of the Year award 1998-99. This video was shot at La Rocque on the South-East corner of Jersey (49° 10′ N, 2° 2′ W) on 30 July 1996 from a high tide of 10.89m at 06:04 through a low tide of 1.16m at 12:47 to a high tide of 11.45m at 18:27, compressing 12 hours and 23 minutes of real time into approximately 90 seconds. This video was shot at Gorey Harbour on the East coast of Jersey (49° 12′ N, 2° 1′ W) on 31 July 1996 from a high tide of 11.44m at 06:53 through a low tide of 0.71m at 13:36 to a high tide of 11.86m at 19:14, compressing 12 hours and 21 minutes of real time into approximately 90 seconds. This video was shot at Corbiere on the South-West corner of Jersey (49° 11′ N, 2° 15′ W) on 1 August 1996 from a high tide of 11.69m at 07:39 through a low tide of 0.56m at 14:23 to a high tide of 11.95m at 19:59, compressing 12 hours and 22 minutes of real time into approximately 90 seconds.